Whether you desire museum quality display pieces or battle ready jousting armour we feel confident you can find it here! Quality Functional Fantasy Sallet Helm Articulated Tail is made from 16 gauge steel and is available with a standard 23 ½" head circumference. This quality functional Horned Viking Helmis made from 18 gauge steel and is available with a standard 23 ½" head circumference. This quality Fantasy Wizards Skull Cap is made from your choice of mild steel, brass or stainless steel with a suede leather lining. 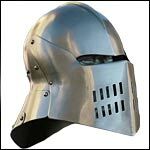 The armor skull cap is available in a standard 23 ½" head circumference or can be custom made to your size. Functional Horned Viking Helm Deluxe GH0179 made from 18 gauge steel and available with a standard 23 ½" head circumference. Weight appx. 7 lbs.